With the ever-increasing crime rates world over, security metal detectors are the most common metal detectors seen nowadays. They are used in clubs, schools, companies and airports and many other facilities. It is fairly normal to walk through a metal detecting unit and upon detection of a metal, to follow it with a handheld scanner, which are like the ones described in the article above. These devices come in all shapes and sizes. They also have a variety of specs. When looking for one, it is paramount to determine what it will be used for or why, by whom and the features. How to Choose the Best Security Metal Detector? This is the world’s most popular series of inspection gadget. It has a rugged look with a high-impact ABS case that can withstand heavy use. It has a 10 inch scan surface for improved scan results. It has the ability of self-calibration and ultimate sensitivity increasing accuracy. It comes with a rechargeable battery kit for the 9V batteries it requires. This device has a proven record of detecting metal targets which have been concealed and it has enjoyed its popularity in the market for the last two decades. The audible alarm is sharp to make sure that the operator does miss out on any response and there is a bright red LED light indicator to bail you out in low-lit areas. You will also have a large surface areas for scanning which will make the whole exercise a bit faster thanks to the large 10-inch scan surface of this metal detector. 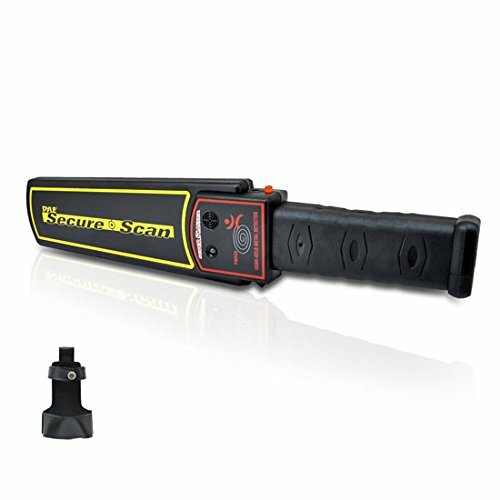 When scanning using this metal detector the Red LED will imply alarm, the green LED light will indicate on, the amber LED light will indicate low battery. You don’t need any adjustments while using this device. This metal detector is reputable for detecting medium sized pistols which could be 9 inches away as well as large knives from as far as 6 inches. You could additionally use the Garrett Superscanner V for detecting drugs and tiny jewelry which have been wrapped in foil. This device can be used for both public and private use. Suitable places where it can be employed include small businesses, nightclubs, schools, airports, in government application as well as in police departments. Its features include audio, vibration and LED target alerts. It also allows the user to choose from 2 alternate frequencies in cases of electromagnetic interference. Its operating frequency is 8.0 KHz. It has a momentary toggle to low which eliminates interference from large metal objects and minimizes signal from small metal objects. It has a low battery indicator and requires one 9v battery that is not included in the purchase. For comfort, it has a comfort grip and wrist strap to lift the 1.1lbs. This device will see to it that you are safe and smart as it is considered to be of professional grade. It is lightweight and quite durable and it can be used for long periods of time. It has standard earphone jack for optional use of purchased headphones. It has a low battery alert for when the 9V battery is running low on juice. The battery is sold separately. It has a storage case for easy maneuverability. The maximum depth while scanning is 13 or 16 inches and the device weighs only 1.58lbs. This metal detector can help you detect metals which have embedded in wood and it may as well be used as a security scan device. As has been stated in the title it also features an audio alarm as well as a visual alert. You will also get an additional 50 % sensitivity reduction button. This is also among the most renowned and respected metal detector having been in the industry for over two decades. It is claimed by those who have tried and reviewed to be able to detect concealed metal targets. It has a large 10-inch scanning surface for quick and accurate scanning, sharp audio and bright LED alarms. You can also use earphones if you desire to conduct silent scanning. It has a low battery indicator for when the 80 hours of enjoying a 9V battery are almost up. This device meets the standard security regulations. It uses surface mount electronic component technology and is made of polycarbonate-fiber reinforced material. It also has a sensitivity reduction switch to help minimize rebar interference while scanning. The use of this device isn’t at all complicated, all you have to do is to press a switch and its accurate and precise circuitry will begin scanning for metallic targets. 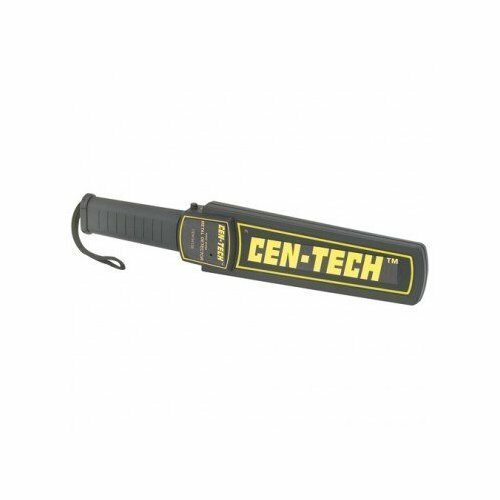 You don’t have to tune this metal detector as it maintains its full amount of sensitivity. You can also make use of its reduced sensitivity mode for scanning near rebar floors or any other ambient metal. Its construction is durable and it is rugged featuring a high-impact ABS case and you device will be well protected even in prolonged use. This device has been engineered and produced in the USA. It is worth noting that this device has been employed in the Olympics since 1984. 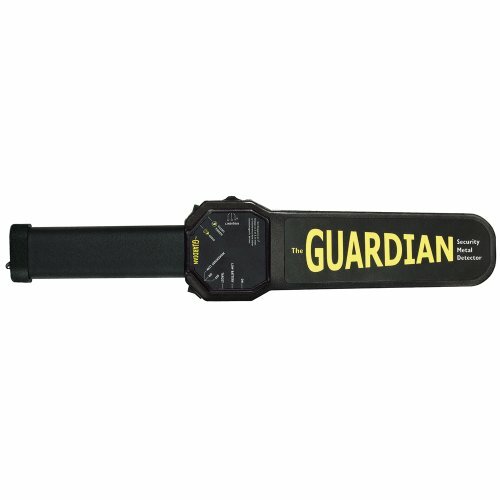 Its durability and dependability has made it the metal detector of choice in police agencies and other security operations. This device is designed for use by law enforcers and security personnel as it enables them to quickly detect dangerous metal targets however small they are. It is very sensitive enough to detect a handgun or knife from 6 inches away. Its large detection area will enable you to carry a scan over a wide area in quick manner but with the thoroughness that is required. The lightweight design and comfortable handle makes it easy to use for long periods of time. It has adjustable sensitivity and has both audible and vibration alert for use in areas of high level noises. The device is powered by rechargeable 9V batteries with a low battery indicator. It comes with hand strap and holster and weighs 13.6Oz. Its adjustable sensitivity makes it to be the ideal MD for use in airports, schools, sporting events as well as prisons. It can be used in both indoor and outdoor events at institutions and generally anywhere you need metal detection. Adjustable sensitivity settings at .4 inch and a 20mm steel ball at 2.7 inch depth. It can detect even the smallest metals. There are two different detection alerts: vibration and sound. It weighs 1.05lbs. It operates within frequency of 22 kHz and operation temperatures of -20 to 90 F. it consumes 270mW to 50mA. The device has LED lights that indicate a metal when it detects one. It allows for reliable security. It can be used anywhere and that is, indoors or outdoors. Suitable places where this MD can be used include cafeterias for food safety, schools, a sports event and any location where you will need an MD that you could rely on. It can be connected to headphones for detection in noisy environments. It has a 3.5mm headphone jack for detection in noisy areas. Its sensitivity can pick out a pen knife at 6 inches. It uses LED lights to show when a metal is detected. There are two modes of notification other than this: vibration and audio tones. The tones vary depending on the metal object size. The sensitivity detection is to that of 2.5mm steel ball. A 9V battery is required and it works at an operating frequency of 22 kHz. It weighs about 13.6Oz and that makes it rather lightweight. This device has a one year warranty. With the ever-increasing crime rates world over, these are the most common metal detectors seen nowadays. They are used in clubs, schools, companies and airports and many other facilities. It is fairly normal to walk through a metal detecting unit and upon detection of a metal, to follow it with a handheld scanner, which are like the ones described in the article above. These devices come in all shapes and sizes. They also have a variety of specs. When looking for one, it is paramount to determine what it will be used for or why, by whom and the features. Too many questions? I don’t think so. What it will be used for determines the brand and the finish. If for everyday use, you would do well to go for durable ones. These will go a long way to help you out in your work demands. If for a building’s security, they will be used over 100 times a day, see? Look for a good quality one too. These are the most common security devices hence a lot of imitations have crept into the market. Watch out for the cheap prices. Not all cheap ones are bad, but there are limits. As they say, if the deal’s too good, think twice. They are used by the secret service, in airports and even at the Olympics. If not accidentally or intentionally abused, most good hand-held metal detectors will require no maintenance. Extended maintenance contracts are usually not required beyond the initial warranty period. The only in-house maintenance that will be required is to provide for the recharging of batteries each night and/or making certain that new batteries are always available. Most good hand-held metal detectors should have a useful lifespan of about 5 years, much more if used infrequently and possibly less if in constant use. Although most hand-held metal detection devices on the market work well, the hand-held metal detector is only as good as the operator using it. This is the ‘by whom’ bit. In order to get optimal functionality, these devices require the users to understand how to keep them safe when not in use and how to use them properly and correctly when working. While it is not difficult to learn to use a hand-held metal detector correctly, administrators should not underestimate the value of annual training for their operators, as well as training for staff who may be called upon to serve as backup or supplemental operators. However, on-the-job practice is important in allowing the facility e.g. school to achieve the type of throughput that will be required in order to process students quickly. Some of the procedures include the following: The detector should be passed over the scannee’s body at a distance of no more than 3 to 4 inches. Avoid touching the body or clothing with the detector. However, for some baggier clothing, such as pants or jackets, it may be necessary to hold the detector against or more into the fabric while scanning in order to stay within 3 to 4 inches of all body surfaces. Most hand-held metal detectors should be set at their highest sensitivity. An exception to this is if there is significant interference from metal reinforcing in a floor or other nearby material that could cause constant alarms unless the detector’s sensitivity is turned down. The body scan should be performed each time in the same pattern so that the operator always knows what parts of the body still need scanning. Given that the type of hand-held detector being used is the kind that provides different volumes of feedback, i.e., a soft squeal versus a much louder squeal, the operator will be able to distinguish between the detection of a smaller innocuous item or material, such as a zipper, and the detection of a larger, more suspicious item. As to the features, there is usually some form of audio alert. The kind of alert should be determined by the venue of work. There are audio tones which are projected through in-built speakers and others which can be played via headphones. The latter will automatically prove more useful in clubs for instance. This is because of the amount of noise is such places. Others have vibrate options as supplements to audio, and this option of alerting the user happens to be the best due to a couple of reasons. The vibration alert will be quite convenient as only the operator will be aware of the signal and this can be quite handy in helping him/her swiftly take the necessary security measures. This option is also the best when one has to search for targets in noisy environments. Another feature is target identification light. This will depend on whether you will be able to see the light. If you miss it, you will miss the identification. The Fisher CW-20 Hand-held Security MD Wand. The Garrett THD only features the visual and vibration alerts. The shape of a metal detector will depending on the level of exposure that you desire. For security purposes which require what you are doing to be concealed you could opt for small devices, and the Garrett THD will be quite appropriate for this. This device has a proven record as it is in use by the military, security guards and the police men. The reason why this device is preferred stem from the fact that it has a diameter of about one inch and it is also slightly longer than a pen in length. This size should not form the basis for its dismal as potent metal detector as its efficacy is even better than the traditional metal detectors. The size of the metal detector you will opt for will highly be determined by your target population. The most common metal detectors in use happen to be the longer paddle shaped ones. 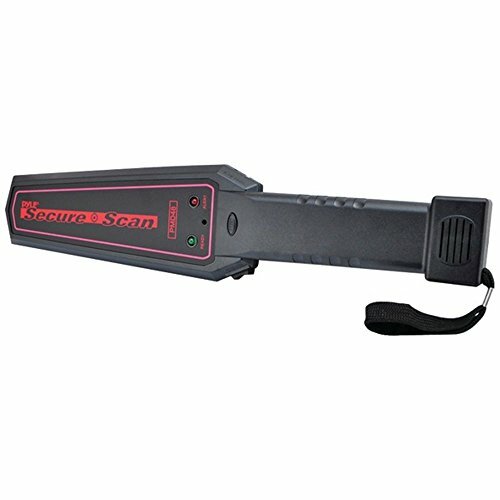 The Garrett Superscanner V and the Garrett Superwand are the best examples of these kind of metal detectors. A majority of your security needs will be met with these metal detectors as due to a design that gives room for a lot of versatility. Hand metal detectors from Garrett are of proven quality and they stand out as the best hand held metal detectors but as had been alluded to earlier you should watch out for counterfeit product in the market. Garrett devices have been certified for use in airports by the NTSB and additionally these MDs have been employed by the secret to ensure that the president is also secure. They are also used during Olympic events as the official devices. In conclusion to be able to pick the best security metal detector there are a couple of factors that have to be borne in mind. You should consider the population that you are targeting, a small population will be conveniently served by a small hand held device. On the other hand a large population will require the use of a walk through metal detector as these will help reduce congestion and the manpower needed for such a large target. The kind of the environment in terms of the levels of noise will also dictate which metal detector will be suitable. A noisy environment will necessitate the use of a MD that employs the vibration alert or the visual alert as the audio alert will not be sufficient enough to notify the operator. The number of security devices in use will also determine the type of metal detector. A heavily armed operator will prefer using a small hand-held metal detector as this will not weigh him/her down during the operation. It is also good to remember that there are three alert options which will alert the operator once a target is detected. Check these out these feature to ensure that you are selecting a metal detector that will be suitable for the both the environment and the number of people to be inspected.